A HORRIFIED horse rider has just told how she saw a little terrier bring ripped to bits by a big cat in Ashridge Woods. Nurse Chris Garvey, of Beaconsfield Road, Tring, said she was out on her horse, Burr, last Wednesday and was just 30 feet away when she saw a strange puma-like beast darting out of the undergrowth and attacking the small dog. Graham Canon, estate manager at the National Trust, Ashridge Woods, near Berkhamsted, believes foxes are the culprits for the dead sheep. Graham said he has received around five reports of seeing this animal, but Chris’ encounter was the most serious one. He said everyone who reported sightings was adamant they’d seen something, but whether it was a muntjac deer, a dog or a panther, he doesn’t know. Chris also claims to have heard several dogs barking at something in the woodland while riding in the previous weeks. Danny Bamping, who founded The British Big Cats’ Society to ‘Prove and Protect’ the Big Cats roaming Britain, said that this year alone, it has received more than a dozen bits of video footage. He said Chris’ sighting was one of the more serious. Chris said: “I heard a dog barking and there was a blood-curdling roar before the attack. There wasn’t any sign of the dog’s owner. 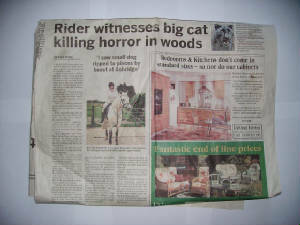 Chris watched, helplessly, as it pounced on the black and white dog, then tore it apart in the attack at 2.40 p.m.
Chris cantered to the Livery Yard, Stocks Farm, Aldbury, and reported the attack to police. So far police have not had any report of a missing dog fitting the description. Danny claims a number of Big Cats have been released in the British Isles over the last 30 years or so with reports of sightings on the increase. In 2002, the Society had reports of five sightings in Hertfordshire, and between April 2004 and July 2005, there were nineteen. In the South West, a Devon farmer came across a skull, which the Society has identified as a Puma. Data also includes three reports regarding attacks on horses, and over thirty-five incidents involving sheep kills. Several paw prints have been confirmed, as well as collections of over six hair samples, some currently waiting analysis. This article was edited by the in-house Senior Editor.